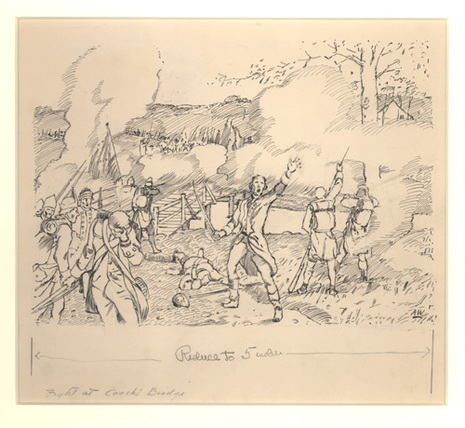 The Battle of Cooch's Bridge was a minor skirmish action between American militia and Hessian troops during the American Revolutionary War. On August 25, 1777, a large British army under the command of William Howe landed at the Head of Elk in Maryland with the objective to march northward and capture the Colonial capital of Philadelphia. During the advance into Delaware, British light infantry and German Jaegers provided the advance guard, patrolling the areas in the advance of the British army and gathering intelligence of the terrain and of enemy movements. George Washington, commander of the Continental Army, had only about 1,000 Pennsylvania and Delaware militia, under the command of William Maxwell, with which to patrol the area in the path of the British army. On September 3, 1777, the advance guard of the British army, which included over 400 Jaeger Hessians under the command of Lieutenant-Colonel von Wurmb clashed with American militia. The Hessians formed a front as they approached a wooded area near the small town of Iron Hill, some 5-6 miles from Newark, Delaware. After a charge, the Jaegers drove off the American light militia into the woods, as the British 1st and 2nd Light Infantry battalions joined in the fray, with the British Grenadiers in their rear. After a fierce, close-quarters fight in the wooded area, Maxwell's men withdrew towards Cooch's Bridge, their line of retreat. Here they met the right wing of Jaegers under the command of Captain Wreden.